How did you get involved in writing about cyber attacks, and a hypothetical and realistic war? It is a big step from being a firefighter, a journalist and owning a marketing agency. 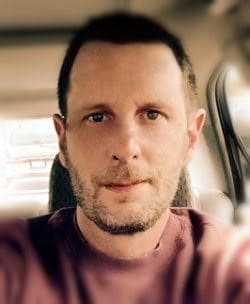 Sam Boush – After I sold my marketing agency, I had some time to finally jump into the career I’d wanted to pursue since I was a kid. (I have this theory that most of us secretly or not-so-secretly want to be an artist of some kind – whether it’s a rock star, sculptor, or scribbler.) So I wrote a novel on one of the subjects I find most interesting, which is the vulnerability of our physical infrastructure to cyber war. 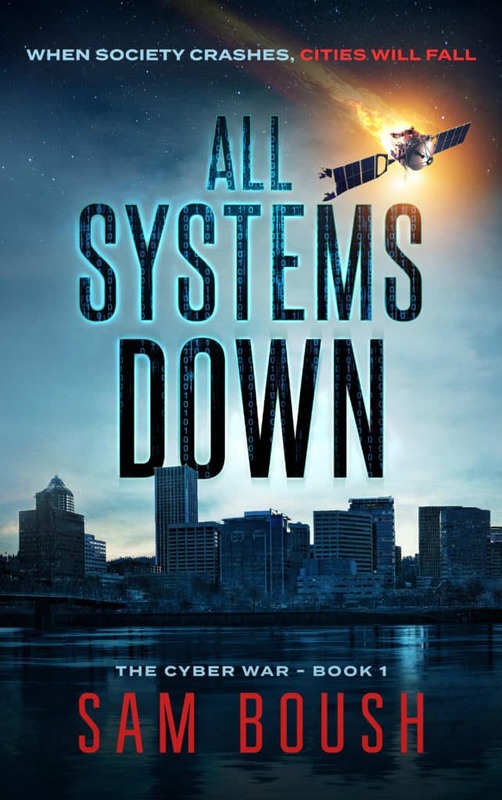 All Systems Down has done pretty well, and I’m feeling good about the sequel that should be out in 2019. Glad to hear the book is doing so well and that’s great news about the sequel! While I was preparing for your interview, I spent some time on your website, Cyberwars.com , and came up with some questions. Sam, you’ve led such an exciting and no-doubt dangerous life first as a wildland firefighter and then a journalist. What led you to being a wildland firefighter and what, if anything, do you miss about it? And regarding journalist, taking into account France and Spain, am I right in guessing you were a foreign correspondent? Sam Boush – Firefighting was probably dangerous, but my journalism career wasn’t. I WISH I’d been a foreign correspondent. But, alas, my most successful article was a science piece about the (ahem) below-the-waist features of snakes. It did win a Society for Professional Journalists award, though! According to your website you have lived in France and Spain, but your heart belongs to Portland. I know there’s a story there, so please tell us as much as you want to share. Were you raised in Portland or does it have everything to do with your lovely family? Sam Boush – I’m originally from Eugene, Oregon, about two hours south of Portland. But I’ve lived in this blustery city for fourteen years, and really do love it. Great neighborhoods, very livable, nice people. And of course, my family, like you say. My kids are elementary-school-aged and I’m pretty sure they like this place as much as any kids can love their hometown. Please tell us about your first full-length story. No, not the first one you published, but the very first one you ever wrote. How old were you and what was it about? Sam Boush –I’ve told the story before about how my first story, as a kid, was Winnie-the-Pooh fanfic. 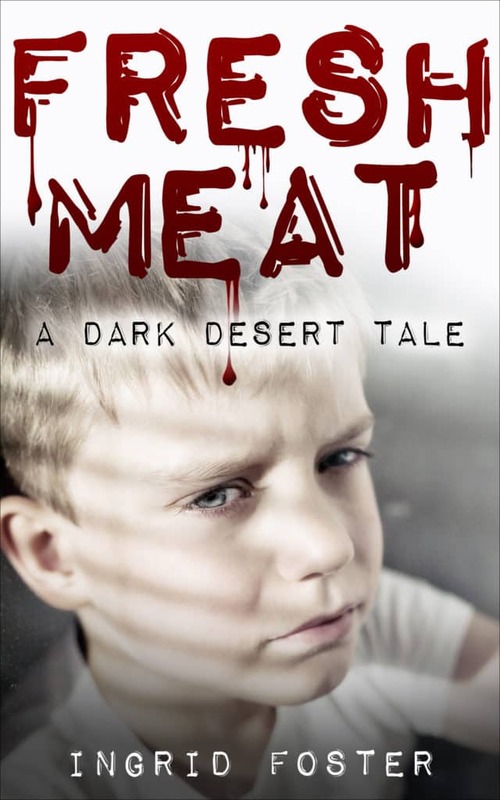 (http://jodigallegos.com/author-spotlight-sam-boush/). But I don’t think anyone has ever asked me about the first full-length book I wrote (and never published) as a teenager. It was a cringy historical fiction attempt about a 7th Century Irishman who gets captured by Vikings. If I can say one good thing about it, tackling that manuscript taught me a lot about writing. Funny enough, the first fifty pages were actually decent enough to get me an award from the Pacific Northwest Writer’s Association. I guarantee that if they’d read the whole thing (as a couple unfortunate agents did) they’d never have given me that award. Sam, congratulations on the award! You mentioned how much you learned about writing while you wrote your Irishman story. What advice would you give new writers, especially those “cringing” after their first story? Sam Boush – There’s so much. The advice I hear a lot is just to keep writing—and I think that’s great. But I’d also add that there’s a lot to the craft of writing that new writers sometimes struggle with. A few examples are: plotting, especially creating acts (as in a three-act structure); ensuring all major characters have a story arc with a resolution; and focusing on chapter-level writing, rather than trying to write perfect sentences. What can you tell us about your next book in the Cyber War Series? 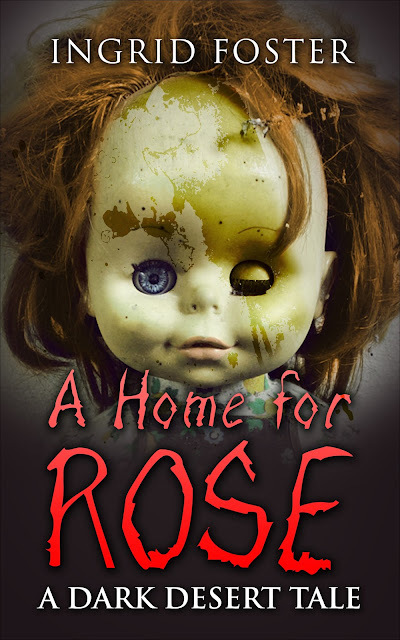 Sam Boush – I can tell you that I’m wrapping it up now and that my publisher should be getting it after I get some more feedback from advance readers. There’s a much bigger military focus in this one, so I’ve got a lot of help from the good people in our armed forces around what they would do in certain situations if the lights went out and satellites started falling from the skies. In Case of Cyber Attack? Wow, how exciting. Can’t wait to read it! Now, speaking of wrapping up, one last question, Sam. If there was a cyber attack on the US, much like in your book, knowing all that you know about the subject, where would you go? Sam Boush – Well, the conceit of the book is that the cyber attack in All Systems Down is hugely devastating. More devastating than we’d probably see in real life because of the difficulty in coordination. But if a cyber war hit us at that scale, I’d probably stay home if I could. Heading out into the country or off camping with my family just wouldn’t cut it. Well, I’m thinking that’s good advice. 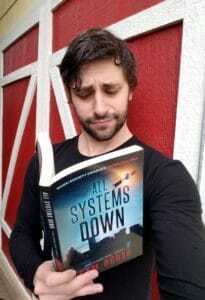 Thank you, Sam Boush, Author of ALL SYSTEMS DOWN, for being here. I wish you continued success in writing career and all the best on your upcoming book. Thank you, SJ, for joining us. The anthology Splintered Love is brilliant but quite different from your Morium Trilogy with its focus on school bullying, I’m wondering where the concept for your collection of short stories came from? Thank you, Ingrid, for having me on your blog. I wrote Splintered Love after I finished the book of the Morium Trilogy, Dark Horizons. I wanted to try my writing skills on something more mature. Something that everyone deals with at some point in their life and that is love. Most romance novels today all end in happy endings. I wanted to turn that around. 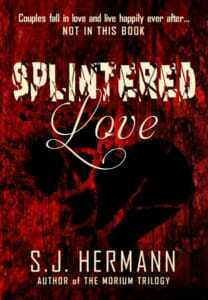 All but one of the stories in Splintered Love have a happy ending. As far as the concepts for each story, I just sat down in front of the computer and started typing, not really knowing where each one would go. All I knew was that they would have a supernatural/paranormal theme. I wrote them by the seat of my pants and wanted them to each leave a question for the readers. I was lucky enough to have a great group of romance writers help me through my first stint as a romance writer. It’s their quotes you see at the beginning of each story. So, did the writers read your short stories before writing their quotes? Yes. They were an important part in bringing each story together. You certainly seem to have a knack for writing the darker side of love. I enjoyed them all, each so different and every one with surprise twists and turns. I also noted what you said about moral questions, this seems to be an ongoing theme for you. May I ask where that comes from? I have no idea, lol. When I start writing, I don’t have the idea to toss in morals into my stories, they just seem to evolve with the story. I shouldn’t say that. Inner Beauty was written for anyone who sees only what’s on the outside, and not the beauty of a person within. The other four in Splintered Love just came to be morality tales by the time I finished writing them. Well, this formula definitely seems to work for you! I sincerely hope to see more of the same in the future. Speaking of which, haven’t you just put out a new book based on one of your Splintered Love stories? Yes, it’s called Eventus and it follows the same formula as, Reckless Thoughts. Actually, Eventus came before Reckless Thoughts. I reworked the ending to follow the romance theme of the anthology. To go further, the book I am currently working on titled, Perfect, is about a teen who is born nearly omnipotent. As he gets older, he gains more abilities. He suppresses his powers until a tragic event happens. After that, he doesn’t give a damn about anything and he uses the powers for his own amusement. It goes into depth about the main character in Eventus / Reckless Thoughts as we watch him grow from an innocent child into a monster. It’s something about having godlike abilities that can make one hell of a story and that’s why I’m drawn to it. Speaking of topics you’re drawn to, I recently got a chance to listen to your interview with Laney Smith on BlogTalkRadio from October of last year. Such an emotionally powerful interview. I especially enjoyed the discussion on the Morium Trilogy and how you’ve used it to encourage a focus on bullying. As someone who was bullied most of her school years, I must ask, how do you feel being bullied has changed you? Thank you for listening. I thought really hard if I should bring out my demons for all to hear. Laney is such a fantastic host it made it easier. For the longest time, even after the bullying had stopped, I would say my Junior year, the emotional scars stayed with me. My self-esteem was in the toilet. I had no confidence in anything I did. Thirty years later, I still suffer from depression and anxiety with bouts of self-harm. Writing has become a tool for me to release some of what I’ve kept locked away, which is probably why my writing is dark in nature. In what ways do you feel your writing has helped you? It’s an outlet to convey how one (myself) deals with emotional problems. I can write about it and yet, I hope, don’t come across as being preachy. Devin is Desperate Souls was/is essentially me. Living in darkness waiting for a glimmer of light to shine through the darkened skies. Now, in the story, it was Moira that’s the glimmer of light. Where in me, it’s the writing. And what reactions have received to your “bringing out your demons”? I hope supportive! They have been positive. The main reason I decided to come out was to show that men do suffer from depression and self-harm and not solely focused on women. We all have our demons. Without my going into specifics and as one who has revealed his demons, what advice would you offer people like me? People who’ve been buried under this crap, afraid of their “shadows” so to speak? Find a creative way to step out from the shadows. For me, it’s not only through writing but with art as well. I understand how difficult it is to express your inner feelings for fear of being called weak, especially if you’re a male. There are so many great resources to turn to for help. Thank you, SJ. I appreciate your advice. Before this interview I did get a chance to check out your artwork on your website and FineArtAmerica.com . I really enjoyed your digital art pieces, especially Spring Serenity and Calm and your use of color in By Dawns Early Light is amazing. Just briefly, because are running out time, how did you get started in digital art? Thank you. I actually started art back in, I would say, sixth grade when I started drawing hockey logos. From there my drawings became of cartoon and animated characters. It was during those times that my eye got trained to draw what I saw. I slowly drifted into landscapes with charcoal and graphite, then to pastels. It wasn’t until the last few years that I moved into digital art. Some say that digital art is not truly art. I beg to differ. It’s using your creativity to create a painting. The same rules apply whether it’s by traditional, or digital. One last question, aside from your next novel, Perfect, are there any other upcoming projects you’d like to mention? I am currently working on the screenplay for the first book in the Morium trilogy. Once that is complete, I send it off to my producer and the long process of having it turned into a movie begins. A movie? How exciting for you, SJ! I think it’s every author’s dream to see their “baby” on the big screen. In closing, Thank you, SJ Hermann, for joining us. Thank you, Ingrid, for having me. 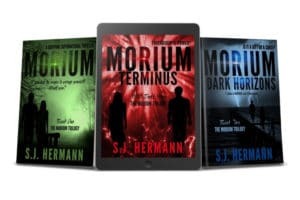 Readers, to learn more about Author SJ Hermann, please check out the links below. Also, as a special treat, SJ has given us an excerpt from his short story, “Leap of Faith.” One of my favorites from his book, SPLINTERED LOVE. He reached under the bed and took out a small silver box graced with a darker shade of a silver band just above the opening. For a fleeting moment, she pondered how many times he had rehearsed this scene in his head, but as soon as he flipped the lid open the thoughts vanished. Wishing she could see the ring through the tears, she fell to one knee. Like most writers, I’m an avid reader and when I’m lucky, I stumble upon an author who has not only written an enjoyable story but has also inspired me. Some books are just to meant to touch your life, as if by fate. For me, two books by Author Barbara Wood have done just that. First, The Prophetess which I read back in the in the early years of this century and now, The Divining. 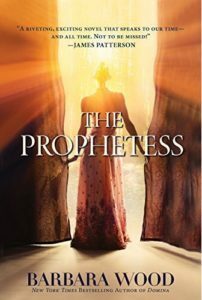 If you enjoyed Dan Brown’s The DaVinci Code and prefer stories about strong woman, Barbara Wood’s The Prophetess, is the perfect book for you. I first read The Prophetess back in 2001 and it immediately became a favorite. 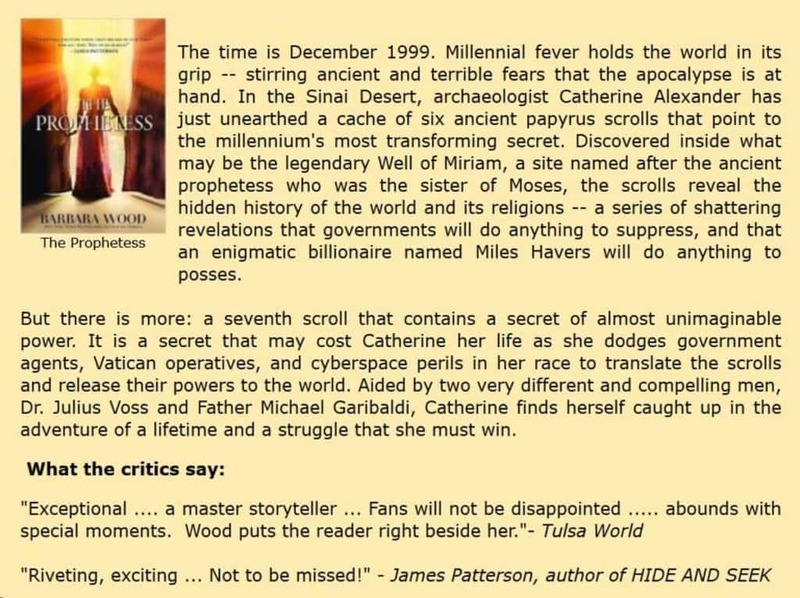 The story centers around a young archeologist who finds a series of papyrus scrolls in what may be the Well of Miriam, the Prophet Moses’ sister. For me, the story ignited the idea that the women in the Bible, though for the most part supporting characters in the male-dominated Word of God, had truly made more of an impact upon our history than what we are led to believe. There’s so much more to this historical thriller that I enjoyed reading long before I’d ever heard of Dan Brown’s The DaVinci Code. But if you enjoyed Dan Brown’s amazing thriller, you’ll love The Prophetess with it’s non-stop action, adventure, and conspiracies! While doing research for my Esme Bohlin Suspense Series, I developed an insatiable appetite for all things Germania. 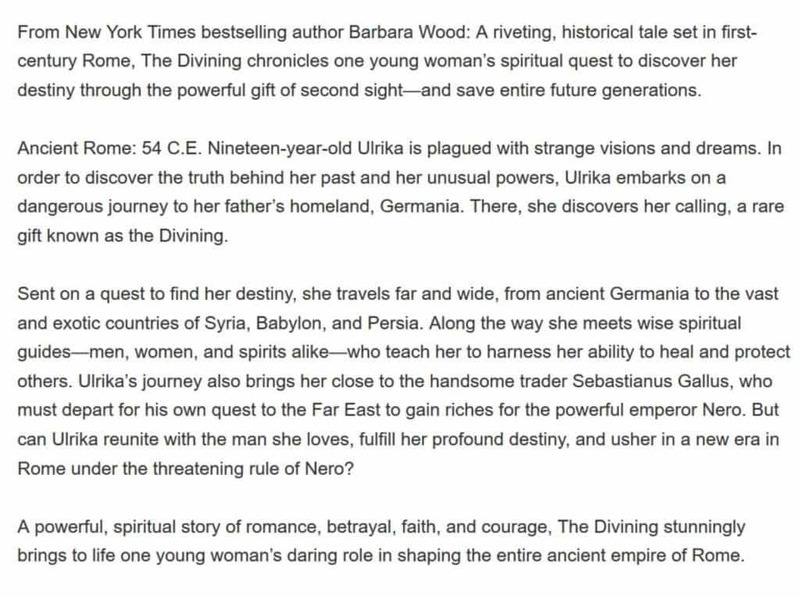 It was then by a stroke of good fortune that I found The Divining by Barbara Wood. The Divining takes place during the 1st century AD when the western world was ruled by Rome and trade with China was still a dream. The main character is Ulrika, a young, amazing but naive woman who, through trying to find herself, leaves the security of Rome to learn more about her mysterious and absent father in Germania. From page one, I was absorbed into a different time and place in history. A time when the early Christian Church was a small group of Christ’s followers meeting in secret and healers and seers were still esteemed by the rich and powerful. 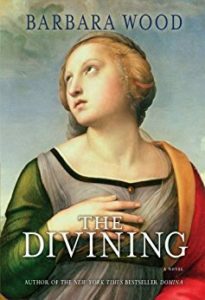 About The Divining (Amazon): And that, dear readers, is my author focus for this week. Thanks for reading! Next week, I will be focusing on another favorite author from my bookshelf, Clea Simon.